If you are contemplating eating only meat for a living, you have to come to terms with the fact that you will be eating from the entire animal, not just the pieces you are used to eating. Primary muscles may or may not have enough fat in them for your nutritional needs. Different parts of the animal have essential nutrients that you need also, so you will be eating things that you are not used to even looking for at the store. 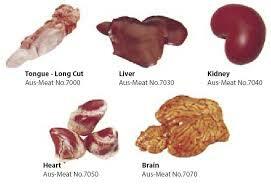 Brains, heart, tongue, liver, kidneys, intestines are all offal. Hardly ever discarded in ancient times, these parts were eaten immediately after slaughter, because they do not preserve well. Meat can be salted or cured. Slaughtering and then cooking the sausages and treats from the animal’s blood and internal organs were community events, ensuring that nothing was wasted before the age of refrigeration. I am conducting an experiment that only allows me to eat meats for the entire month of March. So far in this effort I have proven to myself that hunger is not a problem, no matter how little you eat, measured in calories. I also have determined that a person must drink a quart of liquid in order to keep the excess ketones that are produced flowing out of the body. Don’t want those ketones to accumulate, or an acid is formed if the concentration gets too high. The issue I have now is how does one know that they are starving their body without periodic hunger to tell you when to eat? If I eat a small breakfast and a small lunch then how large does my dinner have to be to make sure that I have eaten enough for the day? The fact is that I really have no idea yet if I am eating enough. I also fear that the variety of meat sources is not high enough. I have a pound of braunschweiger that I purchased at the meat locker. Braunschweiger is made of pork liver, typically, and is a gateway meat to eating offal. I think that eating offal from time to time will be required to ensure that I am getting the nutrients passed on to me that are stored all over a living body. For the last two nights I have experienced a feeling like strained muscles in bed. I guess that I feel it right now too, but since I am up and active its not a distraction. Laying in bed at night its a feeling of discomfort, and I toss and turn. I took tylenol and drank a big glass of water and after doing so I felt better and slept comfortably. It’s still on my mind though and this morning I was all over the internet looking for things that describe what I am feeling. I think I found it on wikipedia. A diet very low in starches and sugars induces several adaptive responses. Low blood glucose causes the pancreas to produce glucagon, which stimulates the liver to convert stored glycogen into glucose and release it into the blood. When liver glycogen stores are exhausted, the body starts using fatty acids instead of glucose…By using fatty acids and ketones as energy sources, supplemented by conversion of proteins to glucose (gluconeogenesis), the body can maintain normal levels of blood glucose without dietary carbohydrates…In the first week or two of a low-carbohydrate diet, much of the weight loss comes from eliminating water retained in the body. The presence of insulin in the blood fosters the formation of glycogen stores in the body, and glycogen is bound with water, which is released when insulin and blood sugar drop. A ketogenic diet is known to cause dehydration as an early, temporary side-effect. I am still in the body chemistry transition period. My aches are due to water release at the beginning of the diet, which can temporarily lower the nutrients contained in me. I am once again convinced that I am not putting myself in danger of permanent injury, but I have to redouble my dedication to drink enough water during the day, and I have to make sure that I eat enough food, now that I do not have the prompt to eat that hunger provides. Being able to eat less without constant hunger sounds good on paper, and its true that you can eat very little food and not suffer constant hunger. The downside to this is that without hunger to tell you how much to eat, it’s possible to not eat enough. Today I am going to eat ‘enough’, and I am going to be sure that I eat enough. Tomorrow I am going to start eating ‘offal’, in the form of braunschweiger, so that I am certain that I am getting all of the nutrients available in my food animals. Last night I was a little bit anxious, today I am reassured. I promised to keep a truthful journal so that you will know what to expect if you go on an all-meat diet. I am also keeping this journal so that I can look back on in and refresh my memory down the road. In the coming weeks we will keep learning together. In the meantime, you should quit eating processed foods. Drink no more sweetened drinks, diet or sugar. If you are ready stop eating so many carbs, and don’t juice your fruits and vegetables, since that changes the speed at which your body takes up the sugars in them. This entry was posted in Health, Living and tagged All meat diet, breaking habits, carbohydrates, dehydration, low carbohydrate diet, offal, protein, protien, real food, real meat recipes. Bookmark the permalink.